Listada de Gandia is a treasure. This prized variety bears sweet, tender, thin-skinned, stunning eggplant. It likely originated in Spain (its name translates as “Grown in Spain”), where it is still revered today. The small 14" plants produce heavy yields of high-quality, 8" oval white fruits with purple stripes and mild white flesh. The variety thrives in very hot weather. 80-90 days from transplant. ±5,600 seeds/oz. 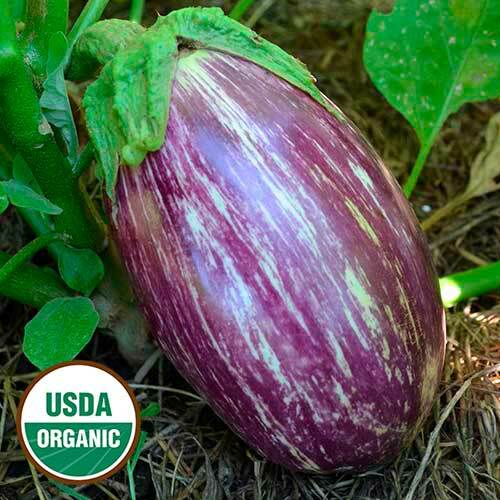 Instructions - Start eggplant indoors 6-9 weeks before the average last frost. Soak seeds first to encourage germination and then sow ¼" deep. Using bottom heat for a week to 10 days will help with sprouting. Transplant in warm soil in a location that gets 8-10 hours of direct sun each day. If growing eggplant in raised beds or containers, keep the plants well watered.